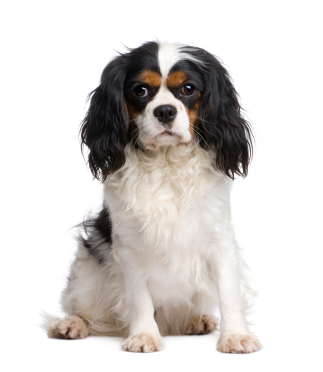 Learn about the temperament and personality of the Cavalier King Charles Spaniel. Discover what he's like to live with, his traits and characteristics and how he generally behaves. And look at lots of Cavalier King Charles Spaniel photos. Their nickname "The Comforter Spaniel" pretty much says it all. This affectionate, devoted lapdog thrives on human contact and will love being part of your family. They will want to sleep in your bed. They are adaptable and can do well in either a mansion or an apartment, but they do not cope well with being left alone for long periods of time. The Cavalier is gentle, friendly, energetic, playful, and dignified. They are intelligent, yet guileless, and are moderately easy to train. They love children, but because they are so small, some breeders will not let them go to homes with young children. They are not yappy, but will let you know if someone is approaching your door. They are sweet and trusting, and love everyone they meet. They are incredibly sensitive and empathic. Their expressive eyes seem to tell you that they are aware of your mood. If you are feeling down, they are more than happy to cuddle you until you are feeling up again -- one of the reasons they make awesome therapy dogs! They are active and energetic, and require a moderate amount of exercise. They like to go for walks, but they also like to sleep on the couch. Just be sure they are kept on lead or fenced in, as they are not car smart. They are also prone to chase anything that moves. This fun-loving breed believes in "the more the merrier" and gets along well with other pets. The Cavalier King Charles Spaniel is moderately easy to train. He learns new commands at the average rate. He is neither difficult nor easy to train. The Cavalier King Charles Spaniel sheds a fair amount of hair. You'll find hair stuck to your couch, carpets, clothes and everything else in your home. The medium-length coat of the Cavalier King Charles Spaniel requires brushing a few times a week to keep it tangle-free.